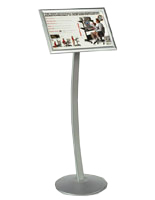 Designed with ease of use in mind, this floor standing sign makes graphics changes fast and simple. 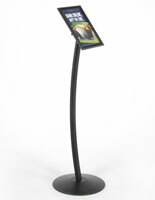 This curved poster holder is one of this site's bestsellers year after year. Each floor standing sign features a unique design that causes passersby to stop and take notice. The single post elevates the frame to a height and angle that makes it easy for viewers to read the message or advertisement. The all-metal construction of this floor standing sign makes this a durable fixture that will last through many years of use. The quick clip frame is convenient and easy to use. 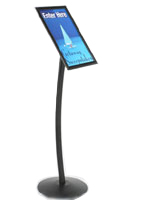 Restaurants buy this floor standing sign for this convenient method of signage change outs. Lift the sides, top and bottom of the frame, insert a graphic, sign, or poster under the protective non-glare cover and just "snap" close. 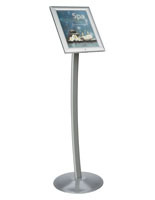 This floor standing sign holder features classic European styling. 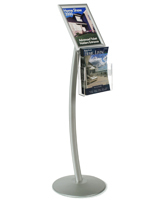 Display an advertisement, menu or custom printed, standard letter size image in this satin aluminum floorstanding display poster. 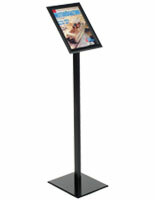 This floor standing sign, also called a signage holder includes all hardware needed for assembly. One person can quickly, and effortlessly put this unit together. This floor standing sign is designed to hold one standard 8-1/2"w x 11"h letter size sign, poster or custom printed graphic. The non-glare lens will keep the signage protected from dirt and other airborne contaminants. 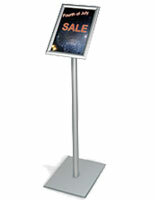 Buy this floor standing sign today and see why it is one of the best-selling items on this website! We are very happy with the quality of this product. We are very happy with your review, Christine! 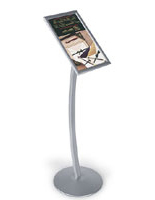 The Floor Menu stand is an excellent product for the price. It is sturdy and the snap open frame holds the display page in place. Would definitely recommend the product. In great condition, very solid, great color and perfect height! It is exactly what we needed to hold our signs as guests walk into our lobby entrance. Very easy to assemble and use! 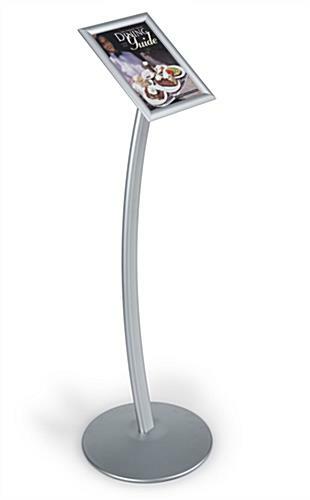 Love the shape, simplicty and elegance of this item. So much so,we are buying another one! Very solid and attractive. Thank you for the review, Emma. If you are planning on ordering from us again, feel free to follow us on social media; we offer various social media-exclusive discounts and deals that you may be interested in for future orders!